In The March of Folly author Barbara Tuchman defines folly as acts that are clearly contrary to the self-interest of the organization or group pursuing them. It would seem like the Fed would fall into this definition. Its mandate is full employment and price stability while also providing prudent financial oversight to minimize the risks of financial contagion (I added the third one). I would argue that, while it’s making progress on the labor front, wage growth is anemic, underemployment is still elevated, and that its pursuit of higher interest rates is spilling over to a much less friendly corporate bond market which could hurt hiring. In addition, the strengthening dollar is putting great pressure on multinational firms and the United States’ export competitiveness. 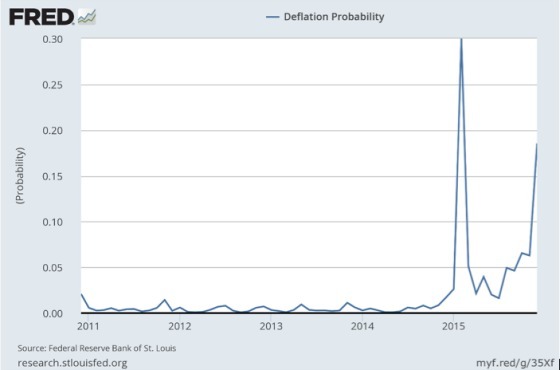 When it comes to the goal of price stability, it has not only been reached, but the greater risk is price deflation if the following chart is any indication. With the December probability of inflation falling between 0% and 1.5% being approximately 67%, this leaves only a 13% probability that inflation will fall within 1.5% to 2.5% over the next 12 months, far below the Fed’s minimum inflation target of 2%. Of course the low inflation is transitory due to falling commodity prices, so says the Fed. The Fed will look through this temporary weakness and supersede all disconfirming evidence and say they know better and this will help give us the tools necessary to fight the next recession despite the fact that this may hasten the next recession. Talk about folly! If slowing corporate revenues and profits impacted by the strong dollar which is reaping havoc among commodity producers and emerging market dollar borrowers along with China weakness, widening corporate bond spreads, significant energy capital spending cutbacks, and corresponding spending cutbacks by oil producing and commodity producing nations aren’t a sign of global weakness that does not appear so transitory, then I don’t know what is. Of course, I’m a fallible human being as well with my own set of biases. 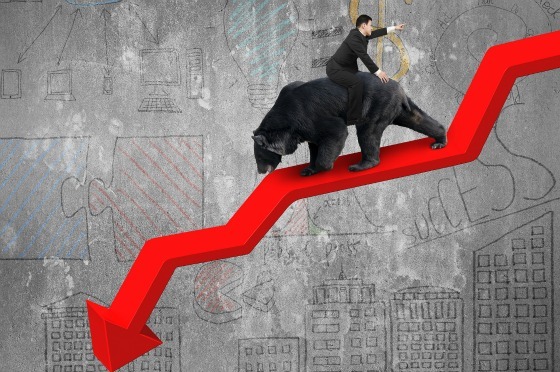 So what are the markets (a generally unbiased set of indicators) telling us right now? 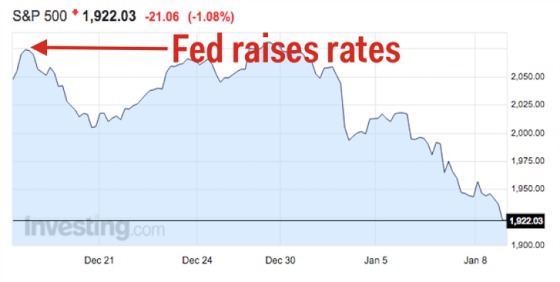 If the markets are any indication, then 2016’s very inauspicious start would suggest that the market thinks the Fed is on a march of folly as well as the following chart shows. 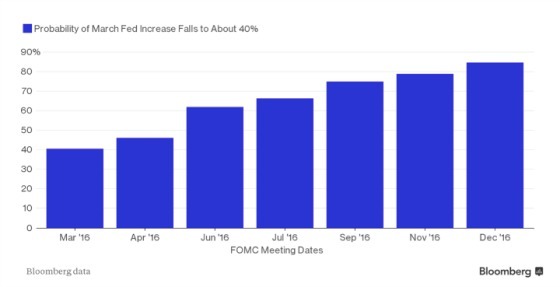 Despite Fed governors like Stanley Fischer saying they feel reasonably confident that the Fed will move rates four times in 2016, once again the market is telling the Fed to “show me the hikes” to paraphrase one of the famous lines from Jerry Maguire as this chart from Bloomberg.com shows. One of the reasons I’ve had some angst about the Fed starting to hike short-term rates after nine years is that it’s been nine years and the economy seems to have baked in very low short-term rates into borrowing structures that do not have a meaningful margin of safety as a result of stability breeding instability in the famous Hyman Minsky maxim. The many years of stability, low-interest rates, and easy access to corporate credit have created a much less secure foundation to handle reversals in any, some, or all of these variables. Economic conditions are shakier, rates are rising, and credit conditions seem to be tightening for corporate credit. This is not exactly the ideal environment to be raising the price of money, particularly with no price pressures to worry about and a labor market that can use more growth, particularly on the wage front. I also know, in the words of Jim Morrison, that when the Fed starts raising rates “No one here gets out alive.” While that may be a bit dramatic, the following chart, and very similar to the one I used as part of a presentation I did at our annual investor meeting in 2005, shows that without fail when the Fed starts raising rates, there is some kind of financial accident. It turned out to be true then and I imagine it will be true over the next couple of years as well. 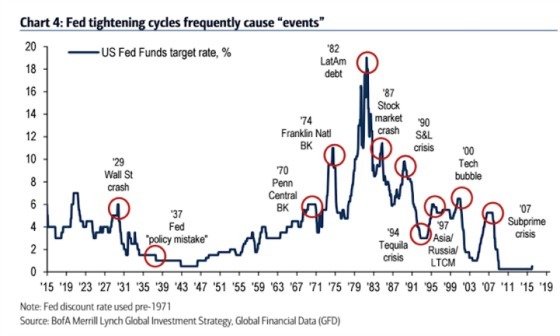 If history is any guide then we are going to run into trouble somewhere if the Fed continues on its path to raise rates four times this year. “Up until December 16, 2015, the Fed had never hiked rates amid a deeper than -15% year-over-year drop by the moving 13-week average of the industrial metals price index, nor was fed funds ever raised when the high-yield bond spread was wider than 625 bp. Recently, the average base metals price index of the 13-weeks-ended January was down by -25% annually, while the high-yield bond spread was 711 bp. So not only is the Fed hiking in the face of powerful deflationary trends (industrial metal prices dropping) but tightening credit conditions as well as evidenced by the increasing and elevated high yield spreads. The March of Folly embodies the direction that the Fed is heading. I’d like to know your thought?